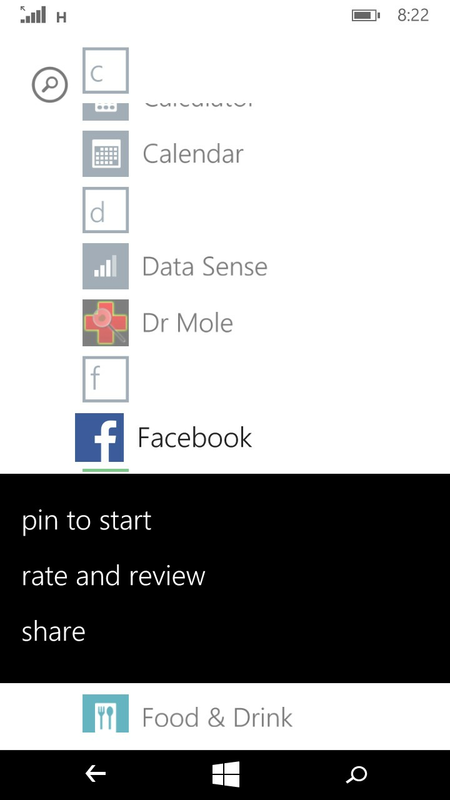 Is it possible to remove the facebook app in windows phone 8.1? It seems like I can uninstall almost all apps, but not the facebook app that was installed when I bought the phone. Is there any way to remove it? I don't have facebook and I will never get it. I also hate that the facebook icon show up in the live tile for people/contacts, so I hope it disappear from that one too if I find a way to remove it. Edit: To clarify, I can't press and hold to uninstall. I just get the options to "pin to start", "rate and review" and "share"
Last edited by Meei; 04-22-2015 at 01:52 PM. It can be uninstalled like any other app by tapping and holding and then selecting uninstall. No I just get the options ""pin to start", "rate and review" and "share". That's why I'm asking. I long press and Uninstall. I agree... No Facebook. I always uninstall it and it never fails to do so. I hear you... You know how the usual uninstall works and it isn't happening for you. Have you tried a Soft Reset? Hold the Volume Down + Power buttons until the phone vibrates and reboots (about 10 seconds). You don't loose data, but the phone boots with a cleared out system memory. If that fails, you would need to Hard Reset or Factory Reset the phone which does cause data loss. Try the Soft reset and get back to us. About the People Tile. Even with Facebook uninstalled the little "f" keeps winking on the tile. The only way around it is to keep the People Tile on smallest size so it really isn't live. Stinks like a 2 week old dead skunk in the hot sun, I know. Last edited by Aman Deep Singh; 04-28-2015 at 02:03 AM. Thanks for your answer. I may try the soft reset but don't think I will go so far so I hard reset. I mean it's annoying to have it and I would remove it if it was a good and easy way, but don't think I want to remove my data. Ah the thing with the people tile was sad too. I guess that's the only bad thing with Microsoft, they seems to love that social network stuff. I'm okay with that as long as I can remove it if I don't need it (which doesn't seems to be the case here). I've never seen this before, and I highly doubt Microsoft made it sort of a mandatory app which can't be uninstalled. Could it be a carrier related thing? When I hard reset my phone, than a whole load of apps get installed, one of which is Facebook. I find that I can't uninstall FB unless it has been fully reinstalled and the phone has been restarted. Visit the Windows Store and try to reinstall Facebook. That's weird. My phone came with some crappy apps that suit the market it comes from (Hong Kong), but I can uninstall all of them. I can't give you any advice on this other than try to visit a Care Center or chat with Customer Support. Does VPN work in TP 10049? Should i install Windows 10 Now? Is this normal/ok in windows 10 Tech Preview 10049?